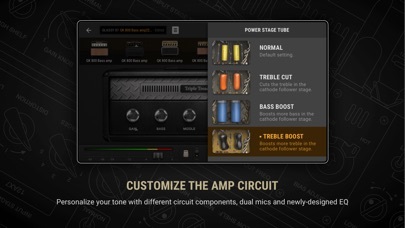 Positive Grid (www.positivegrid.com) expands the popular custom amp modeler with three new dedicated expansion packs: Glassy, Crunch, and Insane. Guitarists and bassists will now be able to add further customization to their BIAS preamp, power amp, and cabinet modules by tone styles: from glassy clean tone, to classic british crunch, to insanely saturated distortion. BIAS includes 36 of the most sought-after vintage and modern amps in rock ‘n’ roll history as a starting point for user customization. Now, along with the new Glassy, Crunch, and Insane packs, BIAS also includes a new easy-to-use 8-band EQ with the purchase of any pack, as well as a new BIAS store and better JamUp integration –another Positive Grid app consisting of several multi effect stompboxes-. As always, user can share it with other musicians on Positive Grid’s proprietary social network, ToneCloud. Major recording and performing artists test drive BIAS with overall positive feedback about it’s endless amp customization capabilities. “BIAS is an amazing amp creation app; being able to extensively modify any head ‘virtually’ and achieve these kinds of tones is incredible! Who would have ever thought you could turn your iPad into a monster guitar amp!” – Glen Drover, legendary former guitarist for Megadeth, King Diamond, and Testament. “BIAS is the best option in quick studio and on tour recordings. It’s the best virtual amp you’ll find anywhere in this world and dimension.” – Charlie Parra, YouTube sensation with over 50 million views. 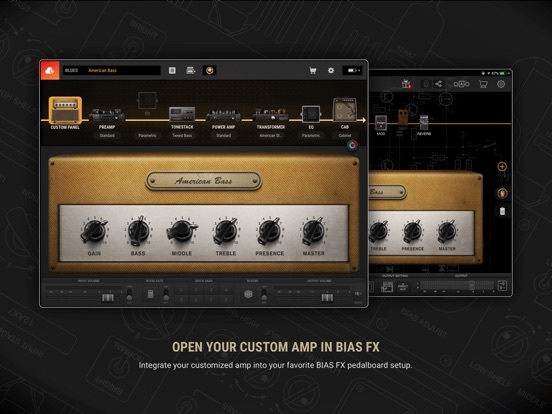 “BIAS is the best amp modeling app I have ever played. It’s really musical and I feel like I’m playing with a real tube amp.” – Jack Thammarat, fusion guitar virtuoso and 2009 Guitar Idol winner. BIAS retails for $19.99; new Glassy, Crunch, and Insane Packs retail for $9.99 each. All are immediately available for download at the iTunes App Store. The app requires an iPad 2 or newer to operate. For more details, visit www.postivegrid.com or follow the company via Twitter (@PositiveGrid) or Facebook (www.facebook.com/positivegrid). StompBox Band – Dual Effect Racks for your iPad, specifically designed for Bands on a Budget and Guitarists who require a dual rack setup. Turn your iPad® into the ultimate mobile Orange guitar/bass multi-FX processor and recording studio! Use the iRig HD, iRig or iRig STOMP interface to connect your guitar to your iPad, and use iRig MIDI to control AmpliTube with your floor controller. AmpliTube Orange was developed with careful guidance from the tone gurus at Orange to ensure the authenticity of the sound. 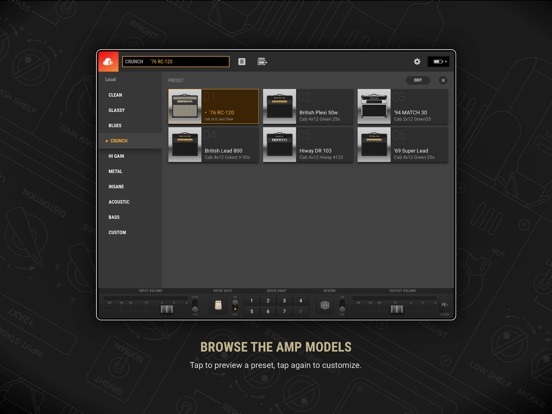 Derived from the award-winning desktop recording studio version, AmpliTube Orange for iPad lets you choose from 6 Orange amp models and 3 stompbox models. AmpliTube Orange for iPad is now Audiobus compatible, meaning it can be opened inside the Audiobus app (a 3rd-party app that requires a separate purchase) and connected to other compatible apps, opening up many more creative options. The built-in Speed Trainer is a robust practice tool that lets you import audio and change tempo without affecting pitch. Load songs, backing tracks or loops from the Music library on your device, or from a computer, and play along. Slow down material (-50%) to learn complex riffs, or speed up material (+200%) to enhance your playing skills. As a multi-FX processor for guitar, bass or any instrument, you can build your Orange rig with 4 simultaneous stompbox effects that go into an amp head, speaker cabinet and mic. Each element has full and separate controls for ultimate ‘tweak-ability’. AmpliTube Orange is also a recording and production studio with a built-in single-track recorder with re-amping ability, which you can expand to a full-featured 8-track recorder with master section via in-app purchase. The new AutoFreeze feature lets you add separate effects chains to each track and tweak them later, if desired. A new 2-measure preroll feature makes it much easier to come in on time when recording. Capture ideas quickly and share your work by exporting high-quality audio files or M4As. Record your band or produce full songs directly in AmpliTube Orange. Put the fun back in your playing with Flying Haggis – the distinctive guitar amp for discerning guitarists. Simply plug in your guitar via any iOS compatible interface (eg IK Multimedia iRig, Apogee Jam) and start playing. Or, connect via Audiobus for additional multi-fx possibilities! Flying Haggis is an all-original amp design with great tones, a nice selection of vintage fx, and a no nonsense interface with all the pick-up-and-play appeal of real hardware. There are no complex menus or screens to navigate. There are no in-app purchases or advertising to distract you. Just start up the app, plug in your guitar, and play. Don’t take our word for it – visit our website to hear examples of Flying Haggis in action! With a realistic vintage tone stack, multi-stage preamp, 6 speaker cabinets and 4 mic positions, you can quickly dial in a massive range of amp tones. The vintage style stompboxes (drawn from db audioware’s extensive fx library) and stereo reverb complete your sound. Audiobus compatibility lets you record Flying Haggis output directly into any compatible app, or process your synths or drums using Flying Haggis as an Audiobus effect. Flying Haggis can also be controlled from any iOS compatible MIDI device. This lets you easily switch presets and manually control any amp parameter from real knobs or sliders. Positive Grid, maker of the leading mobile guitar apps BIAS and JamUp, proudly announce the release of two amazingly robust, fully-programmable Bluetooth MIDI foot controllers with I/O features for iPhone, iPad and Mac: the BT-2 and BT-4 foot controllers. Guitarists, bassists, pianists, vocalists and music producers will now have hands-free control over their iOS and Mac apps using either a two- or four-button wireless foot controller designed to provide total freedom and reliable operation in any live performance, studio recording or rehearsal situation. 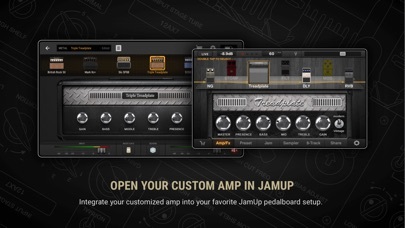 Users of JamUp, BIAS and virtually all other MIDI-supported apps will be able to switch any parameter in the way they need without connecting cables: Guitarists can change stomp box effects in real time, bassists can smoothly switch their volume, and vocalists can quickly turn sheet music on a screen. The BT foot controllers allow JamUp users to virtually stomp on JamUp’s live screen and switch between dozens of studio-grade amp and stompbox effects — all hands-free. They also allow them to control Jam Player’s iTunes song-playback functions, trigger various sampler recording and dubbing options, and even control the built-in metronome and tap out the tempo — all without the need to touch the device screen. Positive Grid’s BT-2 and BT-4 foot controllers are MIDI foot controllers based on Bluetooth 4.0 technology. They allow users to assign MIDI messages to the controllers by using an iOS app that edits the assignments. Each and every MIDI-compatible iOS app supports a standard communication protocol that enables them to be controlled wirelessly. These apps can be from the Positive Grid family of products – JamUp XT and JamUp Pro XT — or any other MIDI-compatible app or desktop software such as GarageBand, OnSong, Auria and so forth. Both BT pedals can be expanded by adding an expression pedal or footswitch using a ¼-inch phone-type jack, allowing musicians to control rotary functions like whammy and wah effects, keyboard sustain, amp gain and volume, EQ and more. The option of having two differently sized Bluetooth controllers allows musicians to choose between a 4-button controller set for full wireless performance when recording and performing or a convenient, ultra-portable 2-button controller set for backstage use and day-to-day rehearsing. Both controllers are designed to fit in a backpack or even a laptop bag, and with its solid metal structure — this is unique in this product category — both controllers will withstand any live performance demands even in the most extreme situations. Independent LEDs are also included for each of the controllers’ footswitches, making visual monitoring easily visible under any lighting conditions, including dark stages. Positive Grid’s new Bluetooth foot controllers retail for $99.99 (BT-4 four-button set) and $79.99 (BT-2 two-button set) and will be available in Spring 2014. BIAS is a brand new app from Positive Grid, the creators of the JamUp Pro series of guitar amp apps and the JamUp Plug audio interface for guitars. Building on the already richly featured Jam Up apps which include a range of mix and matchable virtual guitar amp heads, speaker cabinets, and effects pedals (not to mention multitrack recording and jamming modes as well), comes Positive Grids grounding breaking new iOS app, BIAS, which takes guitar amp modelling to a whole new level of customisation and possibilities. Not only can you personalise the external look of each amp, but more importantly, you can tweak a wide range of tonal settings inside the amp in a way that hasn’t be possible until now. 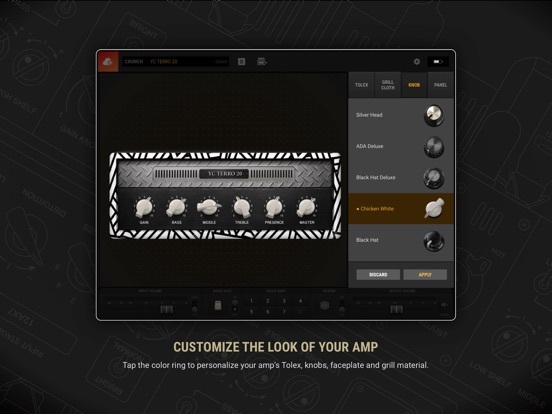 If you’ve played around with any guitar amp apps in the past, you’ll be instantly familiar with BIAS’ main home screen. In the centre of the screen is the selected amp head, below this are some signal I/O settings and user defined presets, and at the top of the screen are nine categories or styles of sounds, each with four factory presets. The styles range from clean and glassy, to blues, crunch, plus there’s a group of settings for acoustic and bass guitars as well. Pulling up any one of these 36 different amps, you have the familiar options of shaping your guitar sound by adjusting the EQ, gain, presence and master controls on the front of the amp. Where BIAS treads new ground, is by allowing you to go virtually inside the selected amp head and tweak an unprecedented amount of tonal settings, from the preamp and power amp stages to the tone stack and even the type of power transformer. One of the much talked about feature of BIAS’ deep customisation is the ability to switch between various tubes, which affect the gain and harmonic tone of the amp, just like they do on real guitar amps. The preamp stage features, 12AX7, 12AT7, and 12AU7 tubes, which can be customised in two groups of pairs. The tubes have their own gain, distortion, and hi/low frequency cut controls, plus you can adjust the number of tube stages, and there are pre and post EQ stage for even further tone shaping. And last but not least, you can alter the amount of harmonics, by adjusting the bias from hot to cold. For those a little overwhelmed by the number of possible settings, or just not sure where to even start, there are a handful of factory presets to get you up and running. And naturally you’re able to save and recall any customised settings you manage to come up with of your own. Moving left of the preamp, is the tone stack stage. Here you’ll find a collection of more than a dozen styles of EQ, which have been inspired by classic eras in music history, from early 50’s tweed amps, and the British invasion sound of the late 50s, through to the unmistakable tones of bands like Van Halen and ACDC. And just like with the preamp, you can tweak any of these existing presets to come up with you own sounds, and save these for later use. Then to the left of the tone stack, is arguably the most crucial stage, the power amp. This also has switchable tubes, including 6L6GB, 6V6GT, EL84, and EL34. Here you can also choose the way the power amp processes the signal, whether it’s a single ended, split load, push pull or even solid state type of amp. Other controls include the usual distortion, gain, tonal adjustments, and again the bias can be set between hot and cold. The other key aspect of tonal customisation involves the transformer stage. There are three transformer types, which are identified simply as British, American, and fat style, each offering slight tonal differences. The other main option in this stage is the choose between solid state or tube rectifier, with GZ34 and 5Y3GT tubes to pick from. You can adjust the compression of the signal here as well. And as with all the amp and tone stack stages, here there are a few presets to get you started, and you can save and recall any of your own personal settings. There’s also a cabinet section, featuring twenty different boxes with varying speaker arrays, from single 12s, up to 8 x 10s. Here you can also choose the exact mic placement in front of the grill, as well as using either a Shure SM57, or AKG C414. The final tonal adjustment you can make, is the option of two eight band EQs that can be literally dropped anywhere along the signal path in between any of the aforementioned amps, transformer, tone stack, and cabinet. Whether you need these or not after all the tone shaping already on tap, it’s still nice to have them available anyway. Of course, what’s a killer sounding guitar amp you’ve just created, without an equally unique look to go with it? 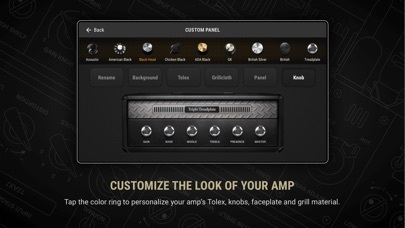 So head to the custom panel area where you can name your amp, and customise the grillcloth, panel, the knobs and even use a photo as a background. There are two other key features of BIAS that are sure to secure its success. The first, and not so unexpected feature being, that any amp you create in BIAS can be opened up and instantly ready to use in Positive Grid’s free JamUp XT or JamUp Pro XT guitar multi-effects apps. A JamUp icon is present at the top of the screen at all times in BIAS, so at any time you can fire up your customised amp by tapping the icon, thereby giving you access to all of recording and jamming features of JamUp, with your newly customised amp. The second, and more surprising new feature that BIAS offers is called ToneCloud. This social sharing platform is build right into the app, and is designed to let users not only share their custom creations with others simply by uploading them, but also lets you download unlimited new virtual amps created by others from all over the world. And it’s a free service. Users are invited to preview one another’s uploaded presets before deciding to download them, plus you can leave comments and ‘like’ a particular sound. Presets are filed into familiar genres, plus there is a ‘latest’ and ‘popular’ section, which is determined by the amount of ‘likes’ a preset gets from users. You can even share a patch on Facebook. 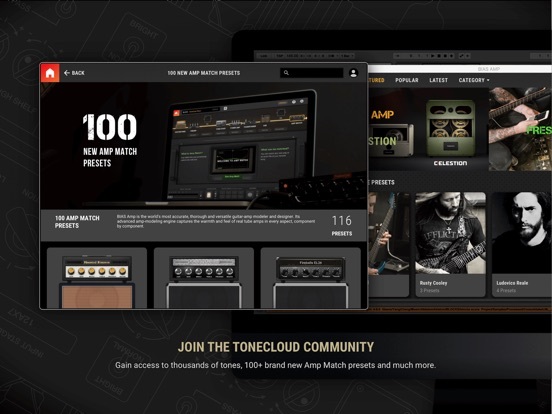 ToneCloud is ideal for those still new to BIAS and are keen to build an instant library of great sounds, as well as seasoned amp modelling gurus, who just want to showcase what they have come up with. But getting back to the roots of this app, BIAS really is an amp tweakers dream come true. Until I’d seen it first hand for myself, I wouldn’t have even considered this depth of virtual amp customisation was possible on iOS, let alone incredibly intuitive for end users to play with. Positive Grid has raised the bar with BIAS, by putting true power and untapped creativity in the hands of guitarists for the first time. Don’t let the initial daunting 30 minutes you first spend with BIAS put you off. Whether you’re a seasoned professional, or even just getting into playing electric guitar for the first time, this is one tool worth having in your musical arsenal. UltraTuner features one of the fastest, smoothest and most responsive tuning engines of all the tuner apps on the market. 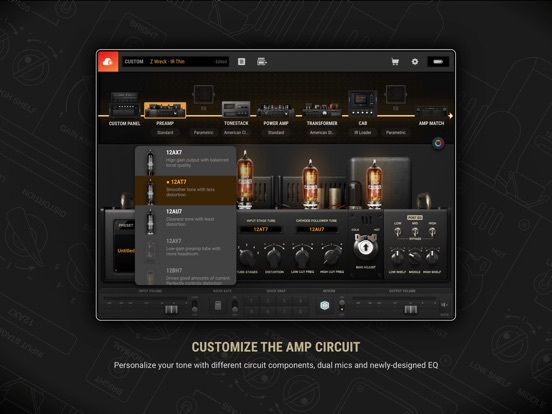 The recently released BIAS (#1 paid music app in 118 countries) brought a whole new level of tone customization to guitar and bass players through a game changing, intuitive amp modeling and designer app. Today, Positive Grid added an new feature to raise the bar again: ToneCloud – the world’s first custom amp sharing platform. ToneCloud is a sharing platform that allows BIAS users to interact with each other and share their custom amps right inside BIAS. Users can now explore popular and latest custom amp models, and can further search by music genres or keywords. Also, sharing is more intuitive than ever: an upload button is always visible in BIAS no matter in what stage of the amp creation process, this makes sharing much easier and faster. With ToneCloud, BIAS users will be part of a tone community with social utilities that allow them not only to create and share custom amps, but also interact with other musicians. 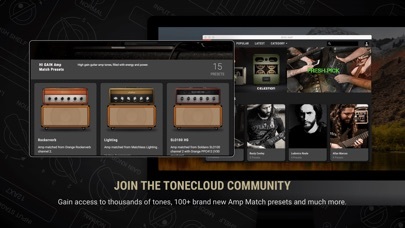 With ToneCloud, BIAS will deliver much more than 36 amp models: it has the whole world of tone, on the cloud. Explore and get inspired by the world’s first custom amp sharing platform. 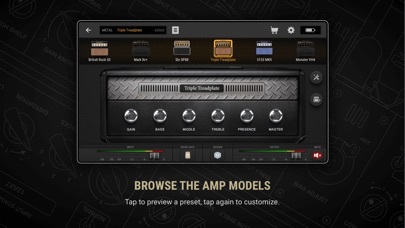 Find popular and latest custom amp models, and search by genre or keywords. “Preview,” “Like,” “Comment,” and “Download” artists and users custom amps. Log in with Facebook for quick access.